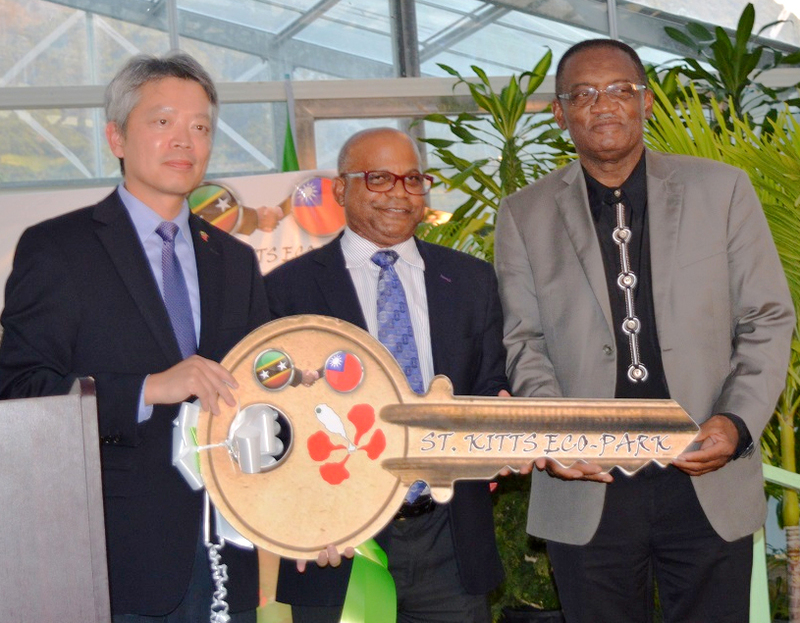 The Republic of China (Taiwan) presents St. Kitts and Nevis officials with ownership to St. Kitts Eco-park, better known as the Agro-Tourism Demonstration Farm Co-Op. The ceremony was overseen by (left to right) Resident Ambassador of the Republic of China (Taiwan) to St. Kitts and Nevis, His Excellency Tom Lee; Hon Lindsay Grant; and Minister of Agriculture, Hon. Eugene Hamilton. BASSETERRE, St. Kitts — For eight years, the St. Kitts Eco-park, also known as the Agro-Tourism Demonstration Farm Co-Op, under the management of the Republic of China (Taiwan), has shown the sustainability of agro-tourism. St. Kitts and Nevis can now boast full ownership of the viable site as on Jan. 24 it was handed over to the government. “The transfer of the Eco-Park marked “a milestone achievement and an auspicious occasion,” said Minister of Tourism, the Honourable Lindsay Grant at a ceremony held at the park’s site in Sandy Point. “This is indeed a proud moment, a significant moment for all of us as beneficiaries, and for the donor, and for the people and the Governments of the Republic of China (Taiwan) and also for the people of the Federation of St. Kitts and Nevis. The minister expressed the government’s heartfelt thanks to the Resident Ambassador of the Republic of China (Taiwan) to St. Kitts and Nevis, His Excellency Tom Lee, his team and the people of the Republic of China on Taiwan. The tourism minister said a variety of activities have taken place at the Eco-Park, including folklore presentations, storytelling, cultural presentations, displays, garden tours and a variety of other unique, immersive activities.